Invitation to play. 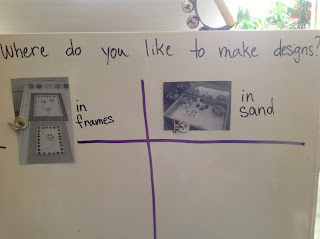 What would you like to make today? 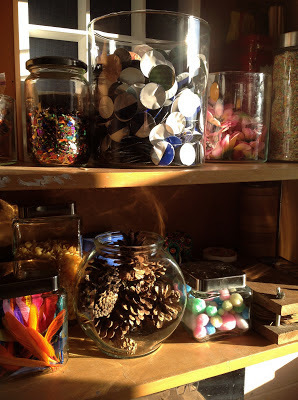 Today I take a break from reflecting upon individual students for reporting to revisit the story I began in the last post: loose parts exploration in my classroom. 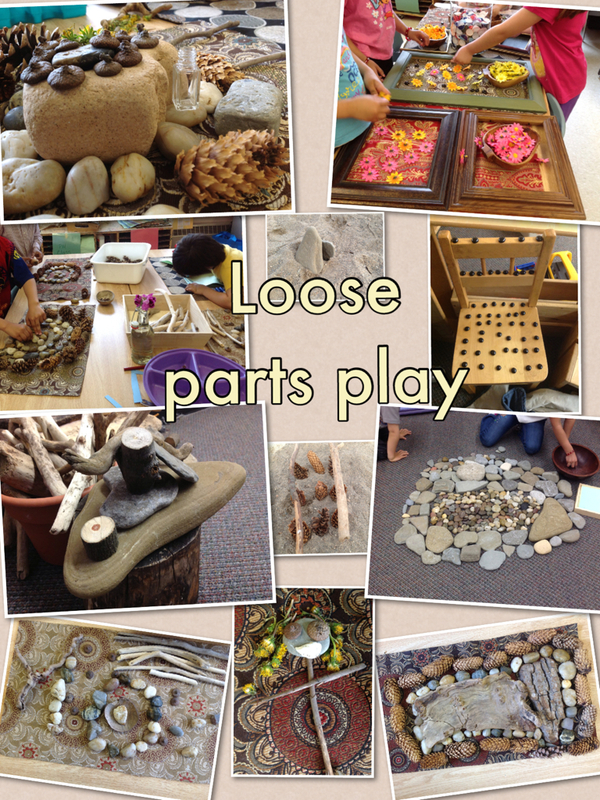 While loose parts play is difficult to categorize because it allows players to imagine endless scenarios and enjoy a tactile experience, there are rather different directions that this play can take. 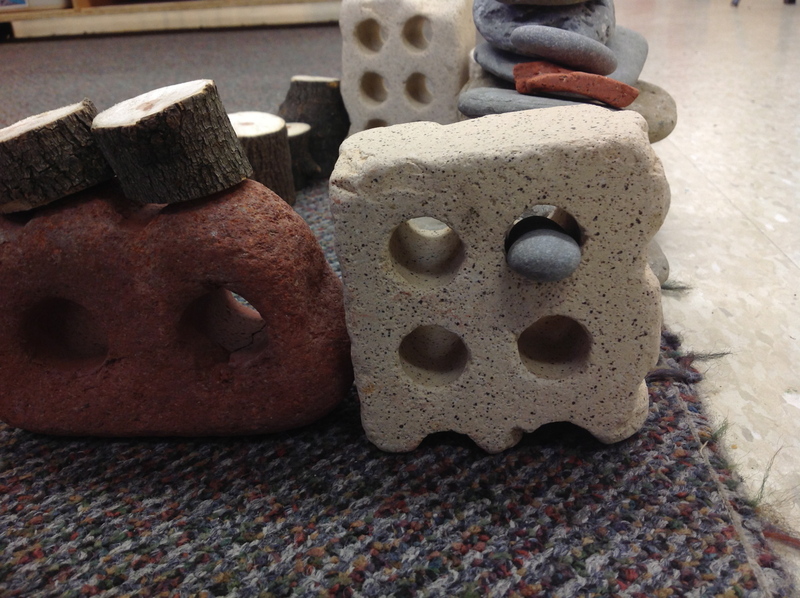 In part one, I looked at the play that evolved when I brought buckets of water-softened beach stones, driftwood, and bricks, and also shared a beautiful provocation in the form of photos of stone balance structures created by Peter Reidel. 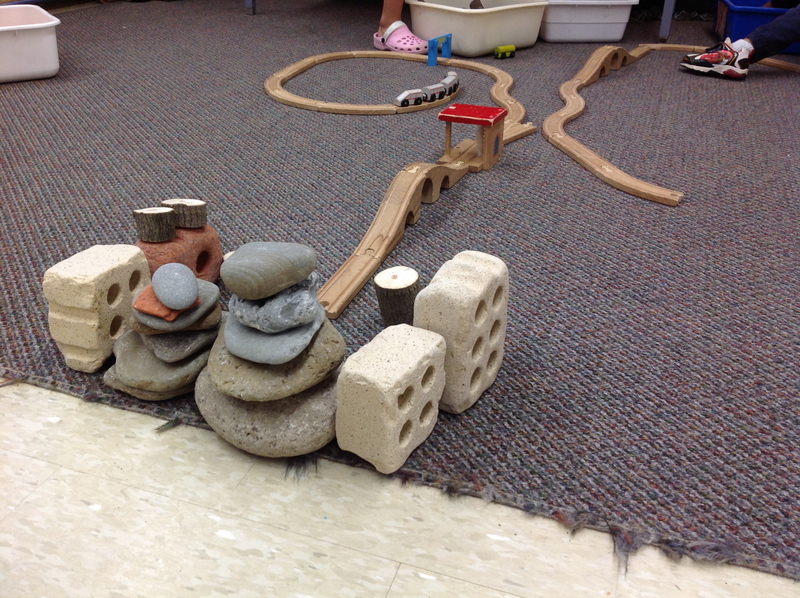 Those stone and wood stacks still grow, tumble, and grow anew in the class. 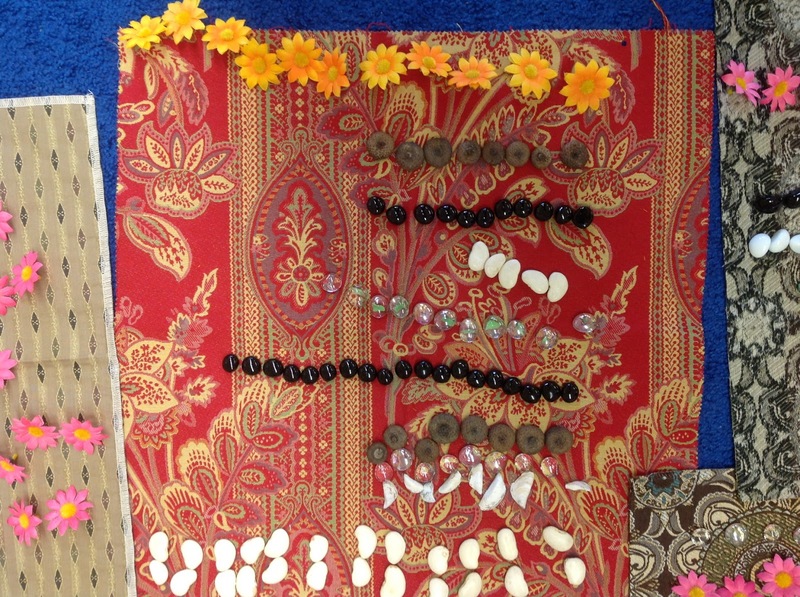 The same materials also spill onto the carpet and onto nearby tables, with jumbles of fancy fabric samples and empty frames, and bowls of stones, glass gems, seeds, acorn caps and other purchased and found treasures. This week I looked over my hundreds of photos and video clips and felt such delight. 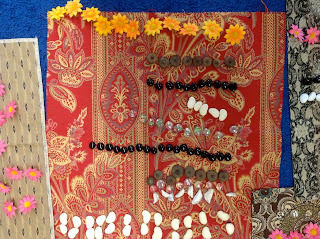 Hundreds of images, because once students know you have a capture device, you are always on call: "Come, take a picture of my pattern!" or "Can I make a video to share? 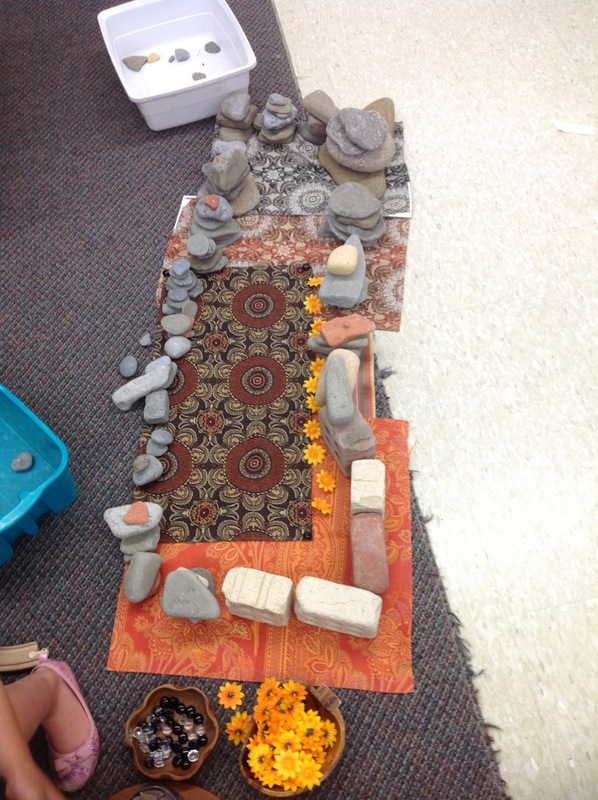 ", "Can we show this to Ms. Croft's class?". All around me, students using the language of design: "I used light ones and dark ones in my spiral", "These lines are bumpy, but these ones are straight", "We made a mandala out of stones and jewels", "I made a pattern. These are bricks, these are stones, acorns, and the shells of the snails". 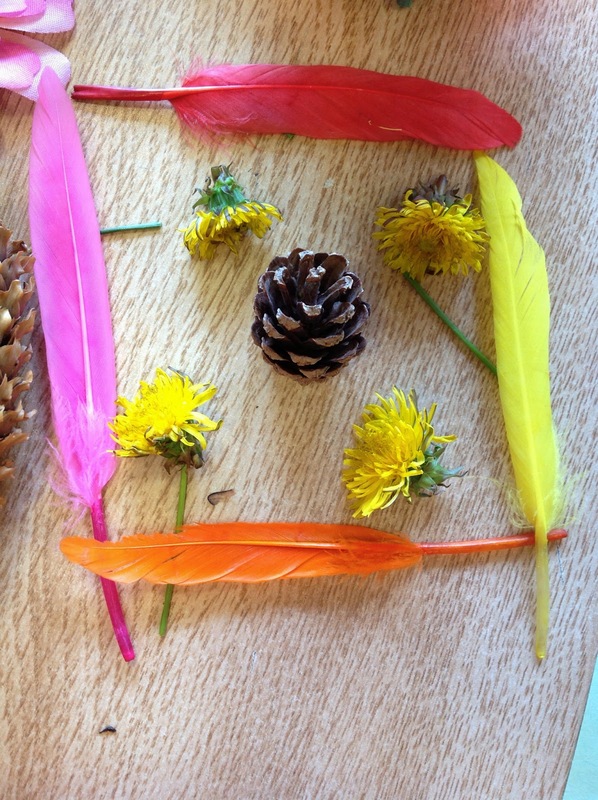 Creations made in the classroom and in our nearby park. 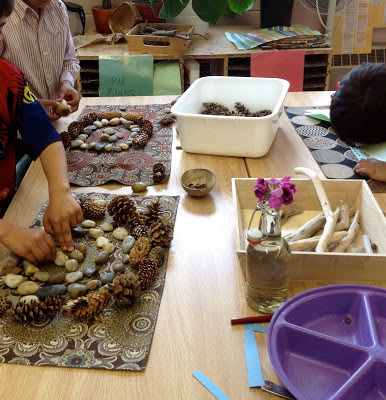 Loose parts are a natural part of the classroom from the beginning of the year, involving much more than artistic or aesthetic exploration. Building structures for small world play, forts to play in, and ramps and mazes, all take place with loose materials such as large wooden blocks and slabs, tree slices, cardboard tubes, and found objects. Adding the little items such as glass gems and shells came slowly over the year, such as when I made my own little light box in the fall. 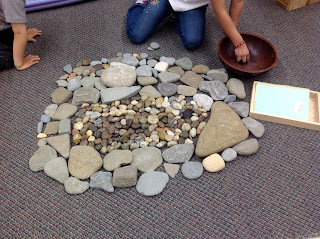 Students enjoyed the light and shadow play, but it wasn't until I began to share images made by "land artists" that I saw the change happen, like it did last year in response to the same provocation. Sharing a selection of Andy Goldsworthy's other-worldy ephemeral art resulted in silence, and then applause. I recommend trying it with your students - many artists experiment and even excel at land art, but there are none in the world like Goldsworthy for sheer wonder. An excerpt (click to play) from "Rivers and Tides, or a slideshow (click to play) of images of his works from over the years would be a nice start. Another inspiring artist to share with beautiful examples of both stacks and mandalas can be found here. 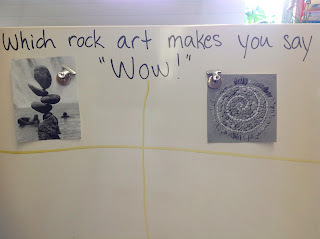 One way to provoke an interesting conversation about what makes art, and what students think about a style of art, is to use the images in a daily sign-in question. For one week, I had students choose between styles of art they might like to try ("Would you like to try to balance stones or make a design?") or which materials they would like to try ("Would you rather use stones/glass gems/pine cones?") or respond to an artist's work ("Which one of these pictures inspires you to try your own?"). 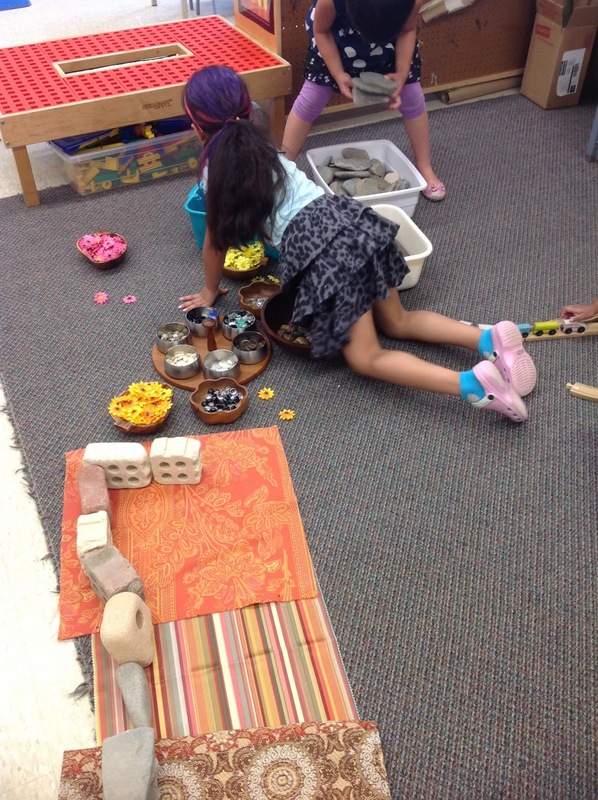 Students mixing materials, and also mixing up their choice of playmates. New voices heard in creative area. I've come to notice how loose parts art have changed the social dynamics in the room in several subtle ways. My "creative area" (the only name I could come up with for the spot in my room with sinks, paint racks, craft and writing supplies, play dough, and natural light from the windows) was often visited by students who enjoyed creating works of art: paintings, little books, clay sculptures, leaf rubbings. 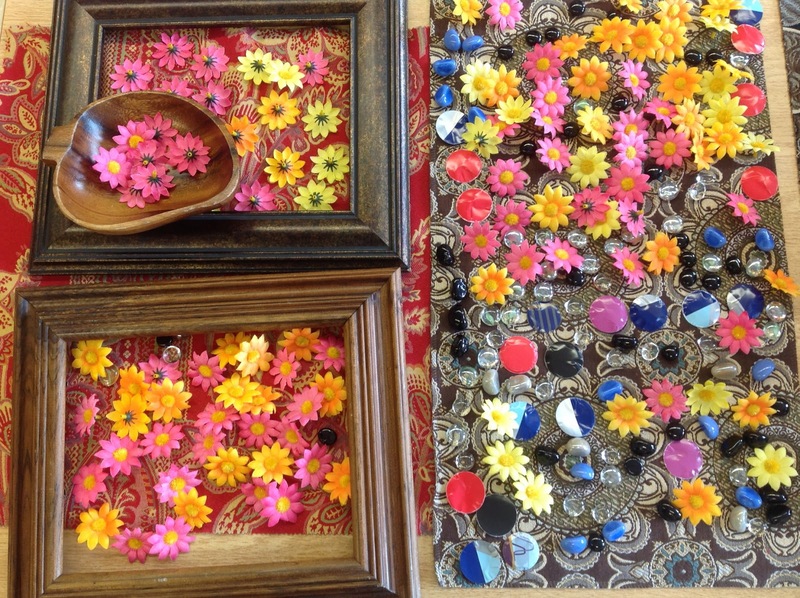 Yes, clipboards were taken elsewhere for drawing or writing, but unless I set out new provocations such as vegetables for stamping with or made ice-pop paints with students, many children opted out of visiting this area. Sharing land art images and providing many natural or open-ended materials lead to artistic exploration taking over the room: light table spirals, stacks on one carpet, structures on the other, flowers and people and other representational art made in frames on tables. Another change in dynamic is the change from individual focus on product (making a painting to take home or hang up in class gallery) to process, often involving several students. There is something almost magical about walking around the room, no longer hearing: "He got brown paint on my painting!" or "I need that colour, hurry up!". No more worrying about the direction to take or fretting over the finished product. 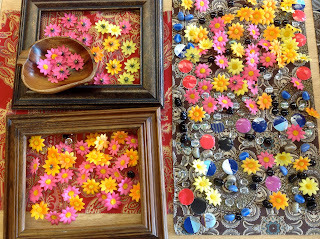 The students have no "finished" product to take home, but what they have gained in awareness about art and about themselves is immeasurable. Loose parts art invites collaboration and problem-solving. 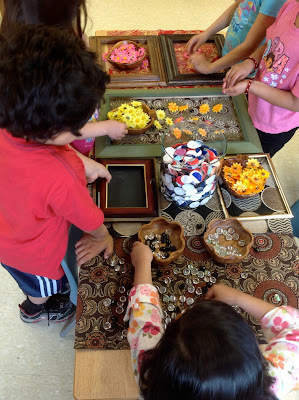 Sometimes it looks like several students working on their own little pieces in frames but sharing bowls of materials, chatting about their designs, offering each other new parts to add or asking for someone to pass them another item. 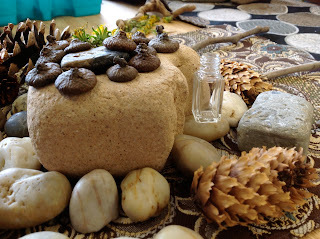 Perhaps it is because I have been collecting so many materials to use, or perhaps it is the sheer pleasure gleaned from playing with beautiful, tactile materials, but I rarely see arguing over materials even in such close quarters as the table below. 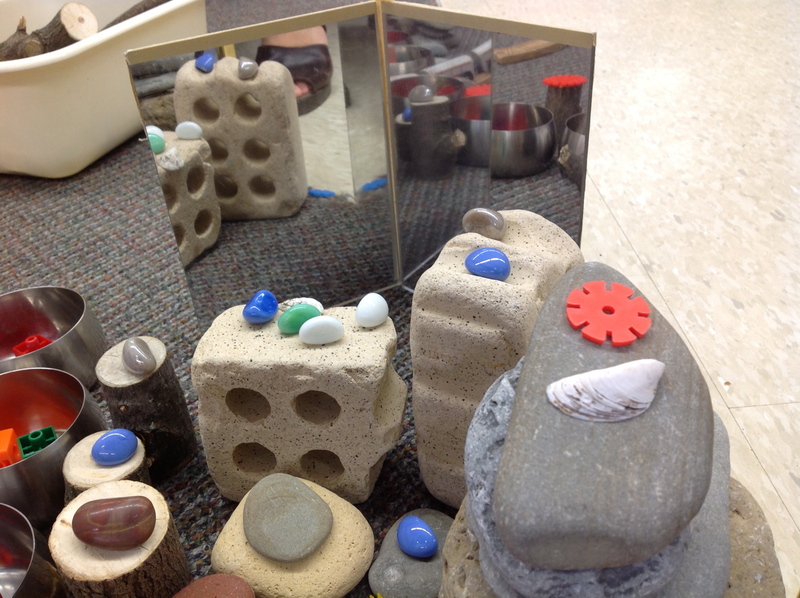 A group of morning friends share materials and space, chatting about their choices and designs. 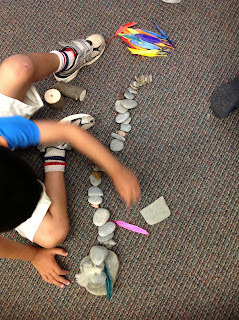 Sometimes it looks like one child beginning a small pattern and then, slowly or all at once, being joined by several more students bringing more materials. 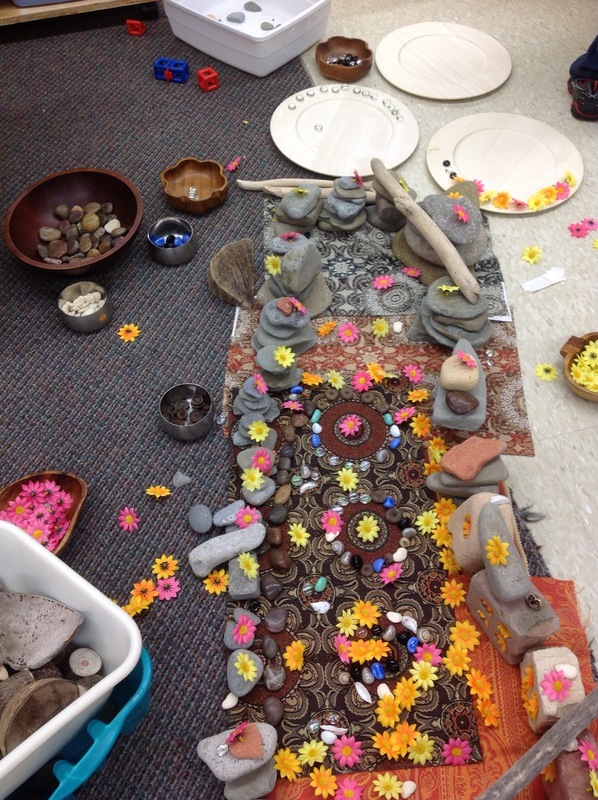 Time after time I have watched students enter into a process already begun, adding their ideas, sometimes knocking things over, sometimes changing the story or design quite radically. What amazes me is how this happens quite organically, with no arguing when a balance stack is accidentally knocked over, and such rich talk amongst the collaborators. The other aspect of this collaboration that delights me is the stamina the children display. I am not entirely certain if this is possible simply because students have developed self-regulation by this time of year, but to see a child or a group work hard and maintain focus for close to an hour, in a busy, noisy room? It is truly a marvel to behold. 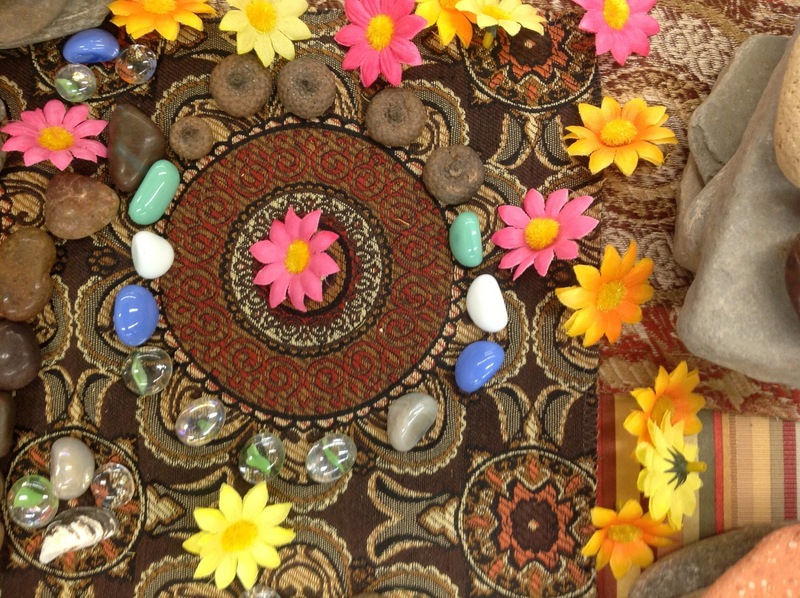 Here are some examples of that magic at work. 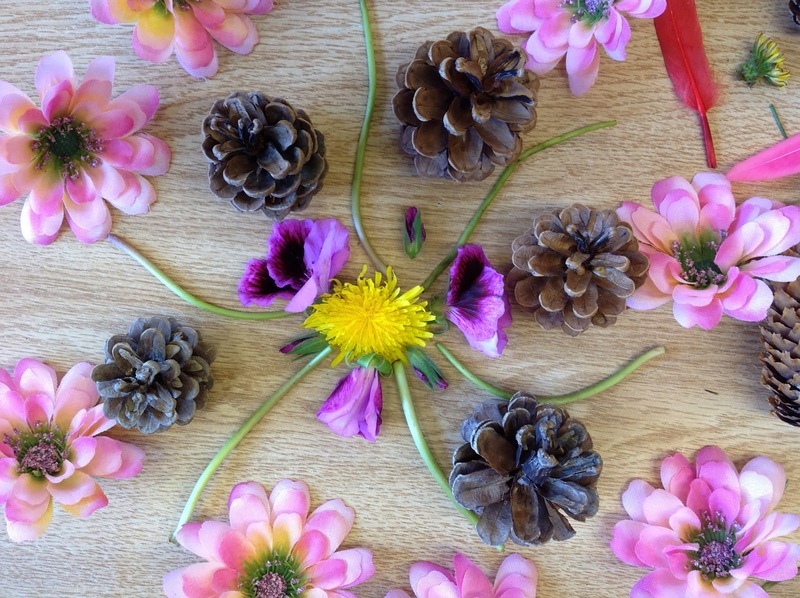 Here are some of the students' creations as captured, by request, in 6-second vine clips. Note: links will open in a new window, on desktop computer. On mobile device it may open in browser or in vine app if you have it installed. Sound will be off, click on the speaker icon to listen. 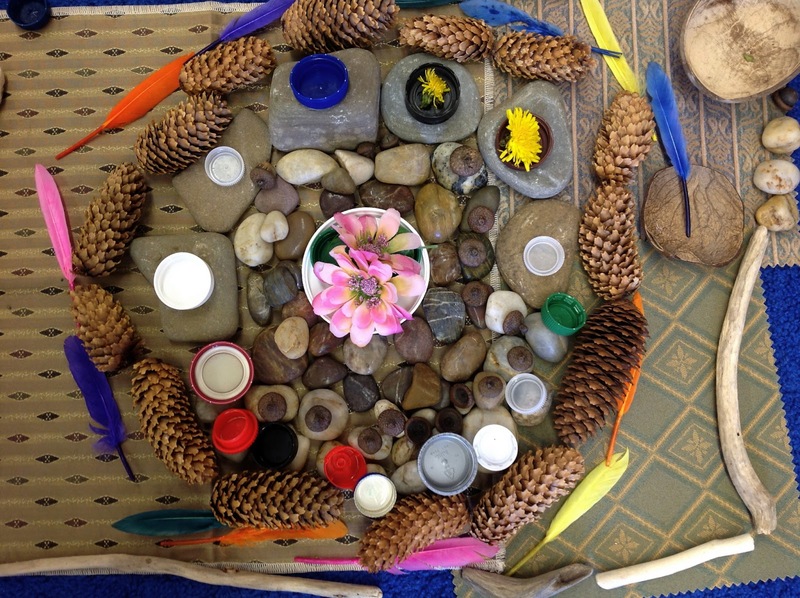 "This is our mandala for our birthday friend" made by the AM class for M on her day. I've been looking for a Lazy Susan like the one in your last picture. May I ask where you got yours? Most of my bowls, dishes, and many of the gems have come from second-hand stores like Talize or Value Village, but it's yard sale season too, so happy hunting! The teak dish with the metal bowls, however, was a hand-me-down family item that I used to use for appetizers. Not as easy to find as the wooden salad bowls (one big, several small) that I buy whenever I find them. 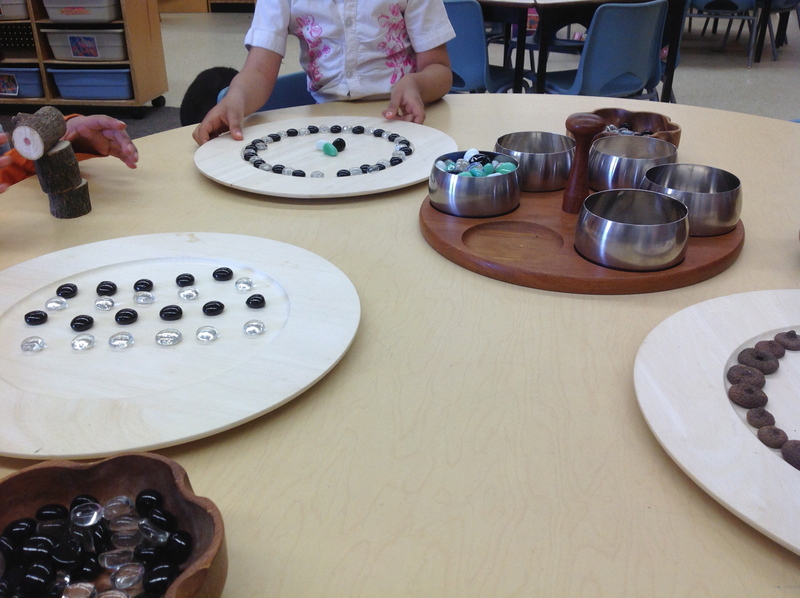 The kids love those bowls, and lug them all around the room. What a fantastic post! You have created such an inviting and beautiful learning environment for your students that has helped make such incredible opportunities for them possible! 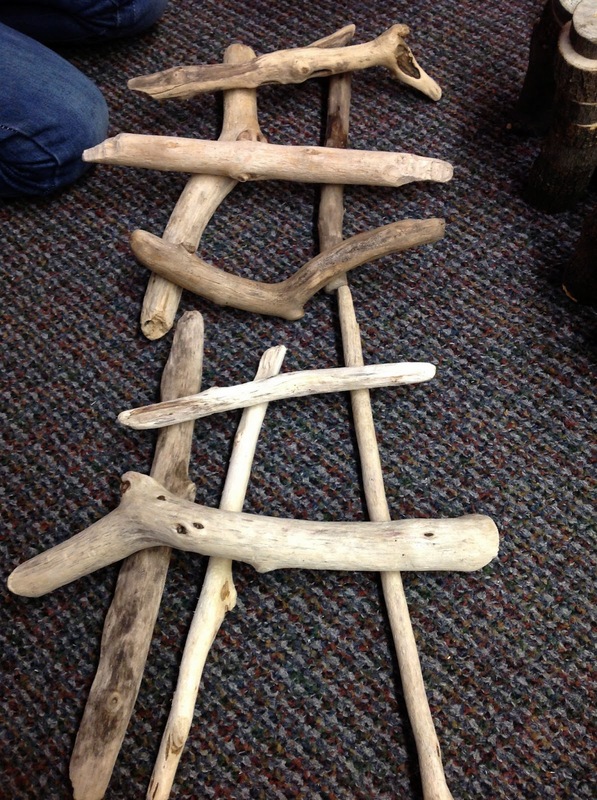 Three words stuck with me as I was reading... ORGANIC, COLLABORATION, and STAMINA. 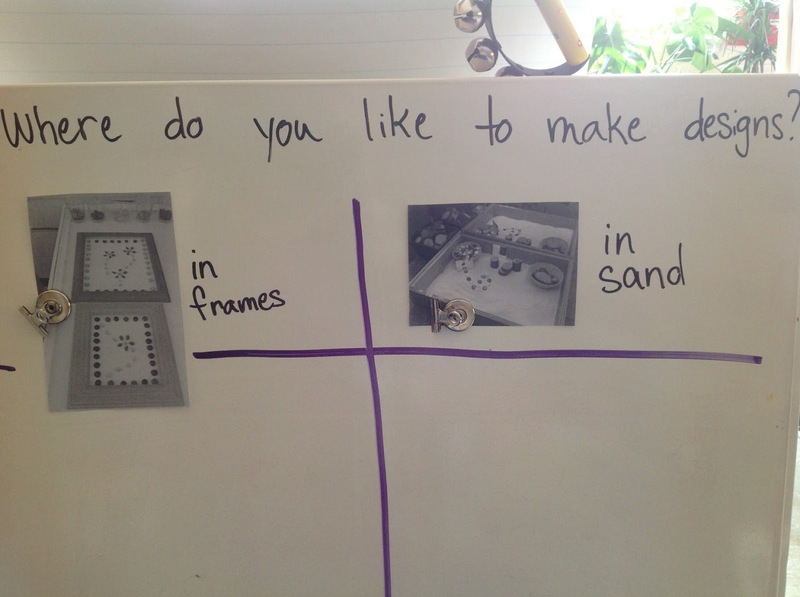 It's amazing how these words elicit such rich dialogue amongst our students and open-ended materials upon exploration are a fascinating learning tool! It's interesting because these three words also ring true when it comes to our own professional learning and development. Thanks for sparking my thinking and sharing your work! Your students are truly lucky to have you as their teacher and it goes without saying, but you're an inspiration to many. I am truly humbled and honoured by your comment. 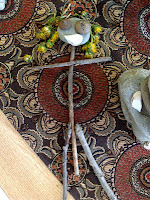 It was people like you, Joanne and Serge (three blogs I've followed for quite a while now) and my wonderful Kindy AQ instructors, who gave me the courage to question everything I was doing, and to throw out what I didn't like. I used the PDSB mantra: "rethink, remove, repeat" to my classroom and to my program. 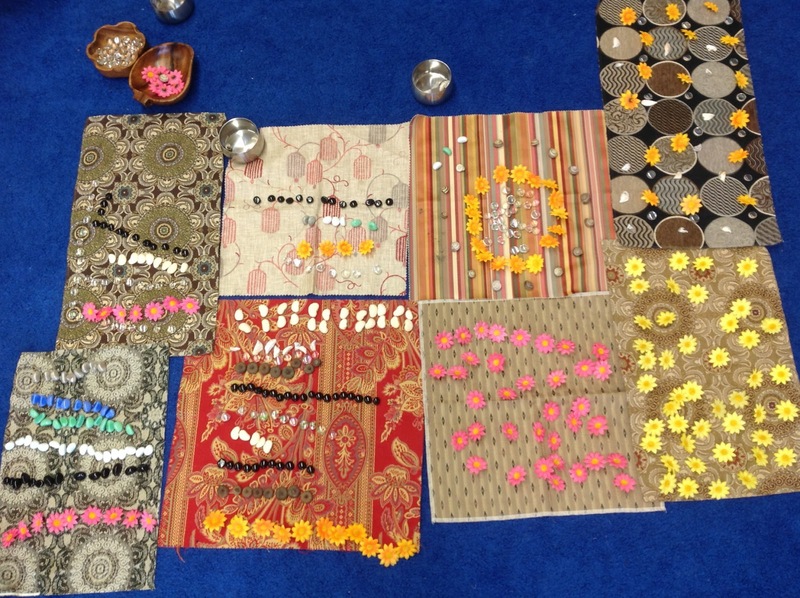 In the last two years, I've seen amazing growth, in my students and in my own learning. I feel so connected to my students, and so incredibly proud of what they accomplish each week. Those three words you picked out... I'm speechless. I love that you caught those, because those are all very important to my goals this year. 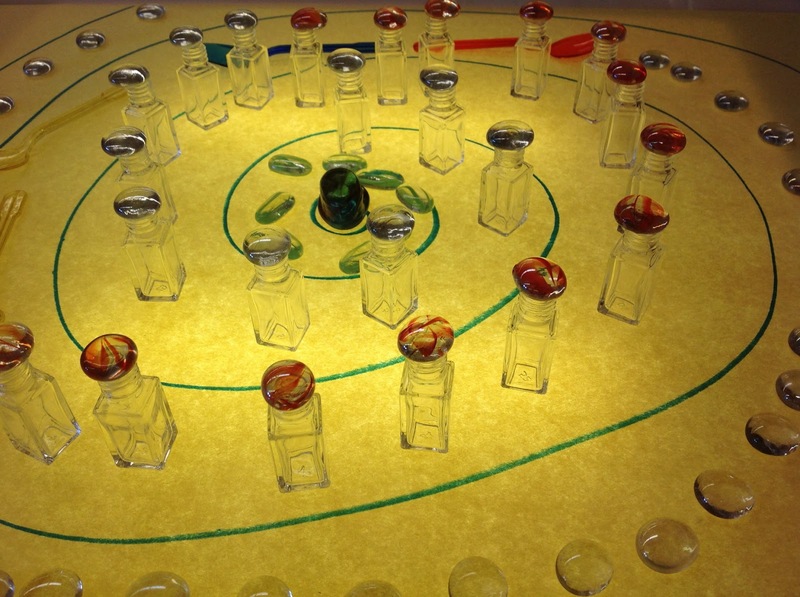 That is exactly what I see growing out of emergent curriculum, even in my fast-paced half-day program. The collaboration allows for such depth of learning, and for all students to feel successful. Organic, because ideas grow and change and sprout up in new ways, but never really leave. Stamina, well I used to focus more on self-regulation, but I've come to see that they are on a continuum. The way that having plentiful, interesting choices for exploration allows students to try many activities and to become aware of their own interests, well, the first thing I see develop is self-regulation ("I love building, but I'm hungry, so I'm taking a break"). Then it naturally expands as students hone their talents and their focus, and suddenly you see students working through challenges that they would never have tried in the beginning of the year. That's a testament to inquiry-based programming, I think. It's not me, it's my students working hard. I'm just glad to be a part of it, listening and helping capture the ideas as they bubble up. Thank you for your images and inspiration! I am excited to know more about your approach. 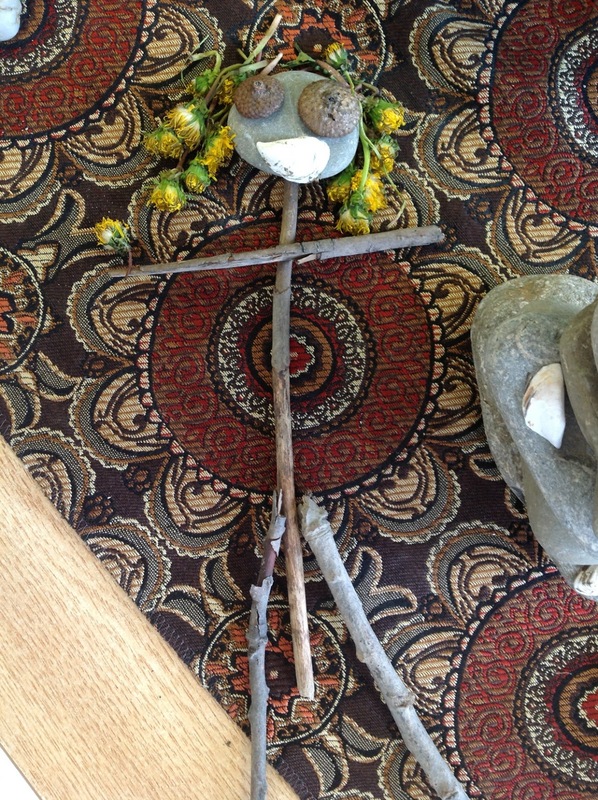 Do you encourage children to move amongst areas as they feel led? Do you have a set number of children in each area? How to you handle snack. Thanks! Love this - so inspiring! Thank you! 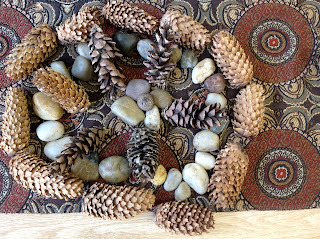 I'm delighted to have found you (thanks to twitter PLN) and your inspiring Pinterest boards. Their creaions are breathtaking. You have a bunch of little Goldsworthys! 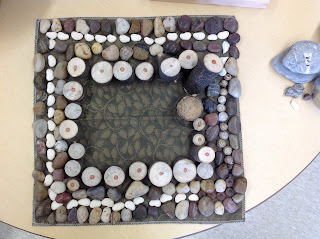 I always find their sense of balance, symmetry, and design comes so naturally at this age. If we can nuture this, imagine what confident artists, risk-takers and problem-solvers they will be as they grow. 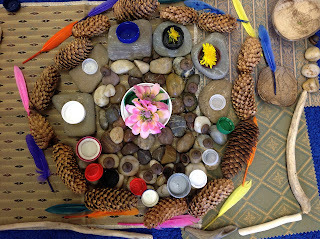 I love the abundance and variety of the materials you offer the children, and how you get them to sign-in and choose what they would like to do. You've inspired me to take a walk to the beach! Thank you, I shall tell them you said so. Now is a perfect time for that walk: geese are moulting. My kids helped me gather a large bunch of beautiful flight feathers this weekend, and today my class were adding them to the play all over the room. A word to the wise, though: when taking home bricks like I did (I love Colonel Sam Smith Park for the treasures!) be aware that many things love to nest in those holes. Such safe, little homes for spider eggs and other creepy crawlies. 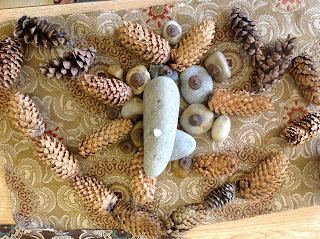 Lovely for little ones to discover, but perhaps not so lovely to discover all over your car. That's another story. It is wonderful to read you after so many years. 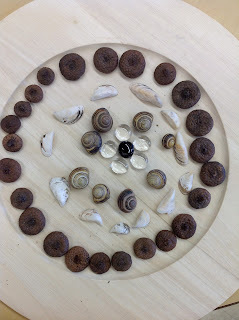 We met at the Summer intensive Reggio workshop with Diane Kashin. I believe I'm squatting in the far left hand corner of the photo in the picture frame souvenir we got. Your posts are inspiring. 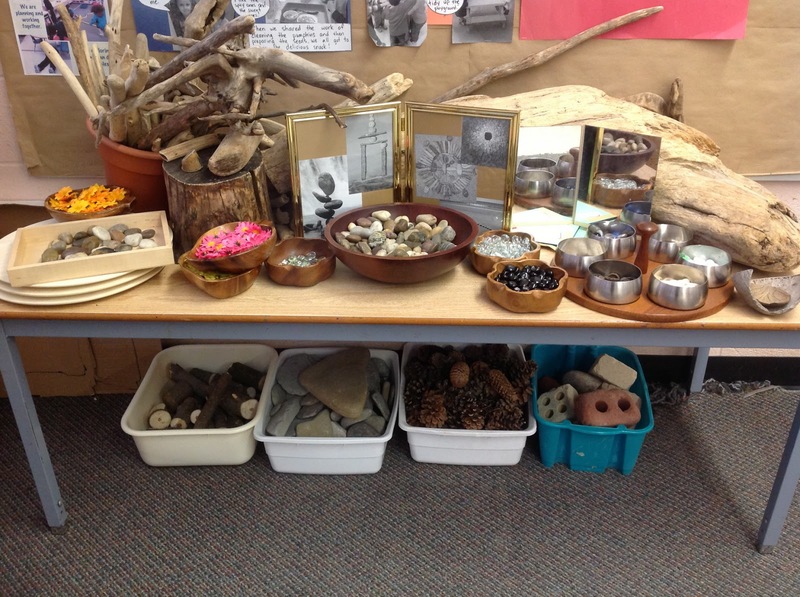 I am volunteering in my daughter's Junior K class at the moment and hope to put together a loose parts area. Your photos are very helpfull. Thanks again. if you have any recomendations, please don't hesitate to pass them on.